The first step is to measure boiler efficiency and Environmental Efficiency using state of the art equipment and qualified stack monitoring professionals. Ensuring boilers operate at peak efficiency is of paramount important in reducing energy costs and carbon footprint. The first step is to measure boiler efficiency and Environmental Efficiency using state of the art equipment and qualified stack monitoring professionals. Most licences issued by the EPA in Ireland have a requirement for boiler efficiency to be measured. However, no limit value is usually set. Environmental Efficiency can undertake this boiler efficiency monitoring. What if the boiler efficiency is low? Low boiler efficiency will result in higher operating costs. It is therefore essential to improve low boiler efficiency. For existing boilers, improved controls such as VSD motors for forced draft fans and oxygen trim can improve efficiency. Other improvements can be made at trivial cost, such as improving insulation. Environmental Efficiency can advise on the most appropriate efficiency improvements for your particular circumstance. Improving boiler efficiency is not the only way to reduce energy costs. Reducing the demand for steam or hot water will reduce costs. Spray head taps are an example of an effective way to reduce hot water demand. In many cases temperatures may be reduced but care should be taken that this does lead to an increased risk of Legionella. Environmental Efficiency can advise on energy reduction strategies and carry out Legionella Risk Assessments. Steam boilers are expensive to operate. 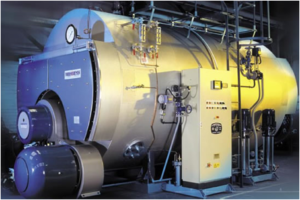 The trend in industry is to replace central steam boilers with locally generated steam or other forms of process heat such as hot water, electric or gas heating. The benefit of decentralising steam is that long runs of steam main with the attendant energy losses are eliminated. Again, Environmental Efficiency can advise on what is most appropriate for your site. New boilers are likely to be more efficient than older boilers. However, before buying a new boiler you should have a fundamental review of why you need a boiler and what size it should be. It may be that the hot water or steam demand is now much lower than originally was the case. In such cases, a smaller boiler will be more efficient as well as having a lower capital cost. Environmental Efficiency can review your hot water and steam requirements and advise on the best boiler efficiency approach. There is much generic guidance both from the Carbon Trust and SEAI. However, such guidance can only be general. Environmental Efficiency has over 20 years’ experience of industrial and commercial property energy audits and is led by a Certified Energy Manager. For expert guidance in this area please contact ourselves.